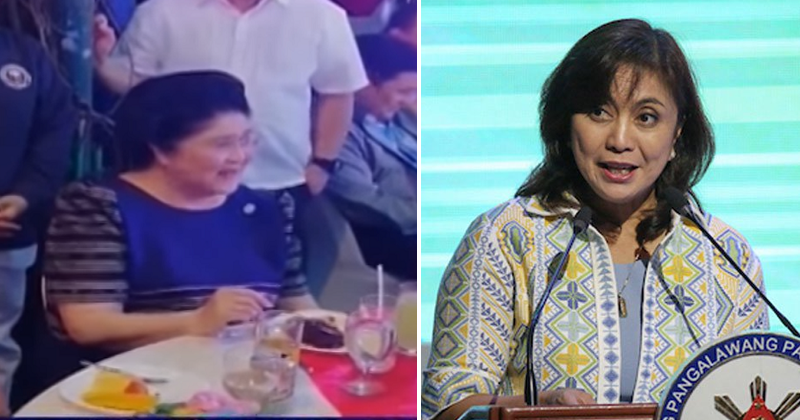 Robredo kay Imelda Marcos: "Kung kaya pang mag-party, kaya pang lumagi sa kulungan"
Former First Lady Imelda Marcos's conviction is further proof that many crimes were committed during the Marcos regime, Vice President Leni Robredo said Sunday. "Patunay lang naman ito na, unang una, marami talagang krimen na naganap noong panahon ng rehimeng Marcos," Robredo said in a radio program on RMN. "Ito kasi, lalo na kapag eleksyon, parati itong dine-deny. Naging isyu ito noong eleksyon; parating sinasabi wala naman daw conviction. Ito, ang pakiramdam natin, hustisya ito para sa mga naging biktima ng Martial Law," she added. Marcos, former first lady and current Ilocos Norte representative, was convicted on seven counts of graft in connection with her financial interests in Swiss-based foundations during her time as Minister of Human Settlements and interim member of Congress. She was sentenced to a minimum of six years and one month to a maximum prison sentence of 11 years for each count, and has been perpetually disqualified from holding public office. Marcos' camp said on Friday that they will appeal the conviction. Robredo acknowledged that the process may take some time if Marcos files an appeal, but said she hopes that the Supreme Court will uphold the ruling. She also stressed that Marcos's age should not be used aas a justification for her to evade imprisonment. "Mali iyong sinasabi nila na dahil lampas na ng 70 years old, hindi na makukulong kasi ito lang naman ay isa sa mga mitigating circumstances under sa Revised Penal Code na bababaan iyong hatol dahil sa edad," Robredo said. "Nakakapunta pa nga sa Congress, nakaka-kandidato pa bilang gobernador, hindi siguro dahilan para hindi dapat ikulong... Kung kaya pang mag-party, kaya pang lumagi sa kulungan," she added. Imelda was seen partying with relatives and friends during her daughter Imee's birthday celebration on the same day that the Sandiganbayan's promulgation was released. Also at the event were Speaker Gloria Macapagal-Arroyo, former senator Juan Ponce Enrile, Solicitor General Jose Calida, Manila Mayor Joseph Estrada, and Davao City Mayor Sara Duterte-Carpio. Militant lawmakers and other stakeholders earlier expressed their concern over whether Marcos will truly serve her prison sentence. The Palace, on the other hand, said that any speculation on the possibility of President Rodrigo Duterte granting Marcos a pardon would be premature.